Targus Rogue Backpack can fit notebooks with up to 15.4″ screens in its protective padded sleeve. 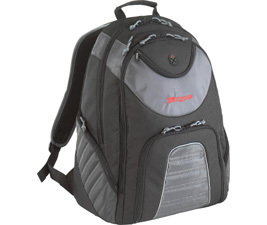 Targus Rogue laptop backpack features seven zippered pockets or compartment storage i.e. front pocket that includes storage for personal items, middle pocket that includes a mesh pocket for storing notebook accessories, pen loops and a business card / ID holder, notebook section includes a mesh pocket with an additional zip nylon pocket attached to the top of the notebook section and accessible from the outside of the backpack and two large side zip pockets allow for additional storage. Beside, the laptop case also includes a zippered nyflexlined pocket for your iPod or CD player storage and a line-out port for headphones. Targus backpack available in black/charcoal color combination with red accents. NotebookReview reviews Targus Rogue notebook backpack and concludes that the Targus Rogue Backpack is a terrific looking backpack. This is definitely a good choice for students or professionals who want a nice pack at an affordable price. It has a protective notebook compartment and plenty of space for a few textbooks or other extras. The Targus Rogue combines functionality with classic design and durability and at $40 is definitely worth consideration.